According to a new report from Strategy Analytics, Samsung’s flagship Android smartphone, the Samsung Galaxy S3, overtook the Apple iPhone 4S in terms of global shipment volumes for the first time in Q3 2012. Samsung’s Galaxy S3 smartphone model shipped 18.0 million units worldwide during the third quarter of 2012. The Galaxy S3 captured an impressive 11 percent share of all smartphones shipped globally and it has become the world’s best-selling smartphone model for the first time ever. While this may be disappointing news for Apple, who continue to market the iPhone 4S strongly, reactions to the research firm’s data have made several important points. While Apple still strongly markets the iPhone 4S, the iPhone 4S has been supplanted by the iPhone 5 as Apple’s premier smartphone. Sales of the iPhone 4S were dampened by rumors leading up to the launch of the iPhone 5, with many customers holding out for the new iPhone rather than upgrading to the 4S. 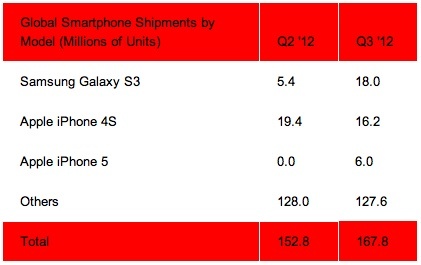 The iPhone 5 has performed strongly in the third quarter of this year with some 6 million shipments worldwide. That figure was achieved despite high-profile labor and technical issues at Foxconn, Apple’s production partner, which severely limited supply of the new iPhone. The strategy firm expects the iPhone 5 to outsell the Galaxy S3 in the final quarter of 2012.